Io's volcanic plains are shown in this Voyager 1 image. Also visible are numerous volcanic calderas and two large mountains (Euboea Montes, just above center, and Haemus Montes, at lower left). The plains include some distinct lava flows, such as those of Lerna Regio (lower right), and low mesas, such as Nemeas Planum (bottom center) and Dodona Planum (just left of center). This scene is about 1050 mi (1700 km) from left to right. 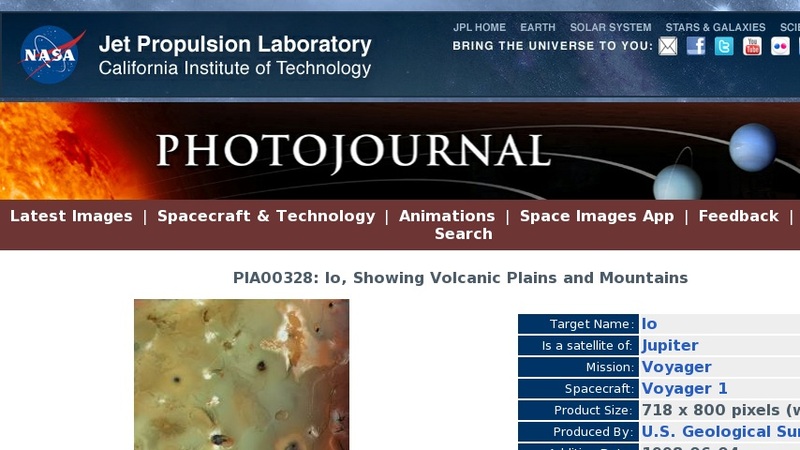 The composition of Io's volcanic plains and lava flows has not been determined, but they could consist dominantly of sulfur or of silicates (such as basalt) coated with sulfurous condensates. The apparent erosion of the edges of some mesas suggests that they are composed of something volatile, possibly including a component of SO2 ice, which is observed spectroscopically to be widespread on Io. The high topographic relief in some areas, particularly of the montes, suggests that those areas are made primarily of silicate rock, which is much stronger than sulfur or SO2. The bright aureoles around several features probably consist of freshly deposited SO2 frost that was vented from cracks and volcanic conduits.